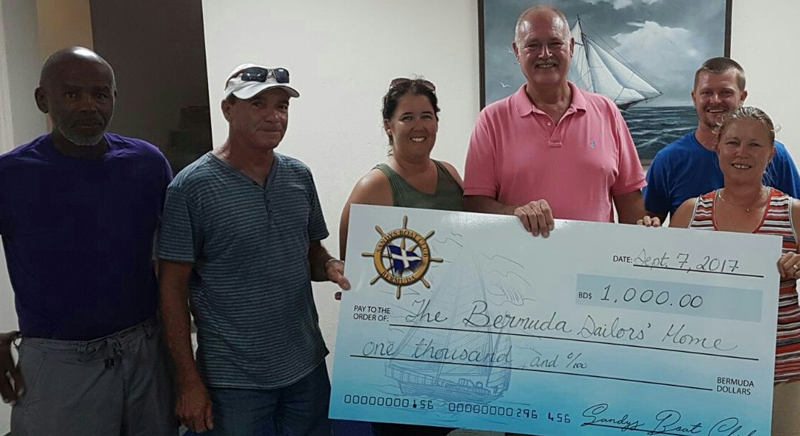 Following the recent NonMariners’ Race, the event’s ‘NonCommitte’ presented a donation of $1,000 to the Bermuda Sailors’ Home. A spokesperson said, “This cheque, in the amount of $1000.00, was raised at the annual NonMariners’ Race, hosted by Sandys Boat Club. The “NonWinner” of the 2017 “NonRace” was the Mariners Rugby team, and they picked this charity as the recipient. “This event also makes an annual donation to the St. John Ambulance. On hand to receive the cheque from Vice Commodore Maureen Sullivan was Bob Grieg of the Bermuda Sailors’ Home.